If you are shopping for someone utterly unique, look no further than our Benchmark Forge triangular titanium fashion ring with lines. This designer ring is made from aircraft-grade titanium, which is so durable that it’s used in numerous aeronautical applications. Titanium never loses its shine and offers superior resistance to scratching, denting, and discoloration. This durable metal is one of the most popular alternative metals on the market, and modern couples love having a budget-friendly alternative compared to platinum or white gold. Each 7.5mm men’s Benchmark Forge triangular titanium fashion ring with lines features a traditional fit, which will sit nicely on your finger for years to come. Our Benchmark Forge triangular titanium fashion ring with lines is truly one-of-a-kind. The three-sided design reflects an architectural approach to accessorizing, and this little number can add a whole lot of style points to any ensemble. The lines cut straight through the band, which is accented by black screws on either side and the Forge symbol. We offer a wide range of sizes to suit any need, from size six to 14! 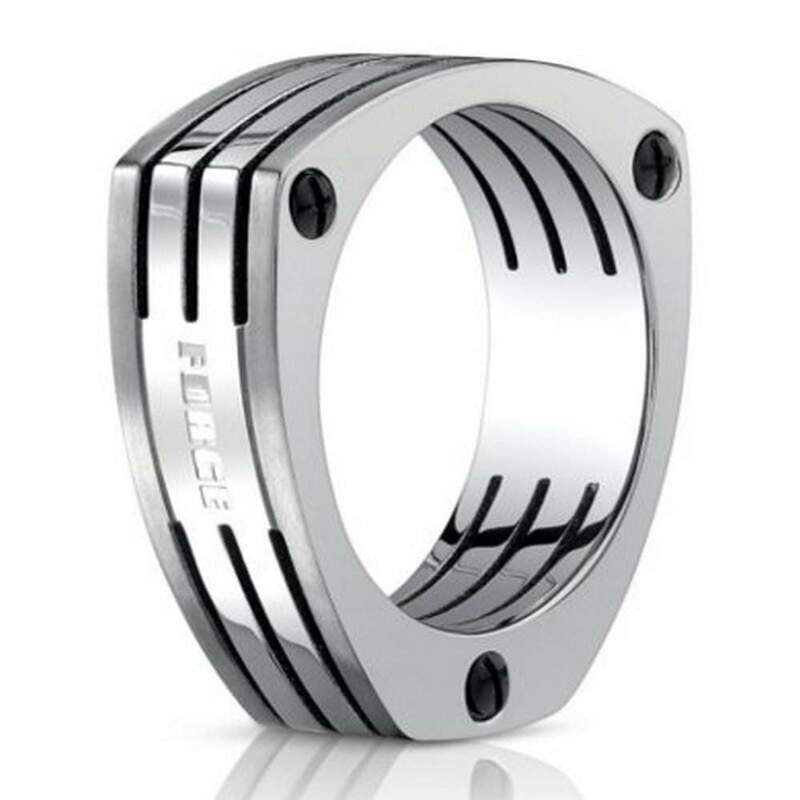 With our 7.5mm men’s Benchmark Forge triangular titanium fashion ring with lines, you will look and feel your absolute best anywhere you go. Before placing your order, we recommend that you have your finger sized for a traditional band by a professional jeweler to see whether a traditional fit suits you and your lifestyle. If you have any questions or concerns, please contact JustMensRings.com for additional information.